WANG, C. , ZHANG, Y. Wide area measurement system (WAMS) mainly serves for the requirement of time synchronization in complex electric power systems. The analysis and control of power system mostly depends on the measurement of state variables, and WAMS provides the basis for dynamic monitoring of power system by these measurements, which can also satisfy the demands of observable, controllable, real-time analysis and decision, self-adaptive etc. requested by smart grid. In this paper, based on the principles of fault correspondence analysis, by calculating row characteristic which represents nodal electrical information and column characteristic which represents acquisition time information, we will conduct intensive research on fault detection. The research results indicate that the fault location is determined by the first dimensional variable, and the occurrence time of fault is determined by the second dimensional variable. The research in this paper will contribute to the development of future smart grid. M. Yigit, V. Cagri Gungor and S. Baktir, "Cloud computing for smart grid applications," Computer Networks, vol.70, pp.312-329, Sep. 2014. 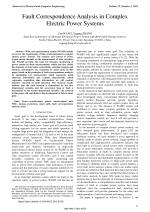 Y. C. Li and Y. L. Wang, "State summation for detecting false data attack on smart grid," International Journal of Electrical Power & Energy Systems, vol.57, pp.156-163, May 2014. G. A. Pagani and M. Aiello, "Power grid complex network evolutions for the smart grid," Physica A: Statistical Mechanics and its Applications, vol.396, pp.248-266, Feb. 2014. P. Kundu and A. K. Pradhan, "Wide area measurement based protection support during power swing," International Journal of Electrical Power & Energy Systems, vol.63, pp.546-554, Dec. 2014. M. Dehghani, L. Goel and W. Y. Li, "PMU based observability reliability evaluation in electric power systems," Electric Power Systems Research, vol.116, pp.347-354, Nov. 2014. G. N. Korres, A. Tzavellas and E. Galinas, "A distributed implementation of multi-area power system state estimation on a cluster of computers," Electric Power Systems Research, vol.102, pp.20-32, Sep. 2013. Y. G. Zhang and Z. P. Wang, "New fault discrimination under the influence of Rayleigh noise," Advances in Electrical and Computer Engineering, vol.13, pp.27-32, Aug. 2013. J. Ma, T. Wang, W. Y. Yan, Z. P. Wang, "Design of wide-area robust damping controller based on the non-convex stable region for inter-area oscillations," International Journal of Electrical Power and Energy Systems, vol.55, pp.473-480, Feb. 2014. E. A. Zamora-Cárdenas, B. A. Alcaide-Moreno and C. R. Fuerte-Esquivel, "State estimation of flexible AC transmission systems considering synchronized phasor measurements," Electric Power Systems Research, vol.106, pp.120-133, Jan. 2014. A. Giani, R. Bent and F. Pan, "Phasor measurement unit selection for unobservable electric power data integrity attack detection," International Journal of Critical Infrastructure Protection, vol.7, pp.155-164, Sep. 2014. J. Ma, S. X. Wang, X. Gao, Z. P. Wang, "Contribution factors based optimal selection of wide-area signals for power system damping control," Electric Power Components and Systems, vol.42, pp. 935-944, May 2014. N. Anwer, A. S. Siddiqui and A. S. Anees, "A lossless switching technique for smart grid applications," International Journal of Electrical Power & Energy Systems, vol.49, pp.213-220, Jul. 2013. S. M. Hashemi, M. T. Hagh and H. Seyedi, "A novel backup distance protection scheme for series-compensated transmission lines," IEEE Transactions on Power Delivery, vol.29, pp.699-707, Apr. 2014. P. K. Nayak, A. K. Pradhan and P. Bajpai, "Wide-area measurement-based backup protection for power network with series compensation," IEEE Transactions on Power Delivery, vol.29, pp.1970-1977, Aug. 2014. X. Y. Tong, X. R. Wang, R. Wang, F. Huang, X. Y. Dong, K. M. Hopkinson and G. Y. Song, "The study of a regional decentralized peer-to-peer negotiation-based wide-area backup protection multi-agent system," IEEE Transactions on Smart Grid, vol.4, pp.1197-1206, Jun. 2013. P.V. Navalkar and S. A. Soman, "Secure remote backup protection of transmission lines using synchrophasors," IEEE Transactions on Power Delivery, vol.26, pp.87-96, Jan. 2011. N. Liu, J. H. Zhang and W. X. Liu, "Toward key management for communications of wide area primary and backup protection," IEEE Transactions on Power Delivery, vol.25, pp.2030-2032, Jul. 2010. Y. G. Zhang and Z. P. Wang, "Bifurcation criterion of faults in complex nonlinear systems," Physics Letters A, vol.378, pp.18-19, Mar. 2014. Y. G. Zhang and Z. P. Wang, "A novel approach to fault detection in complex electric power systems," Advances in Electrical and Computer Engineering, vol.14, pp.27-32, Aug. 2014. Y. G. Zhang, Z. Zhao and Z. P. Wang, "Comprehensive detection and isolation of fault in complicated electrical engineering," Electronics and Electrical Engineering, vol.19, pp. 31-34, Nov. 2013. S. G. Lin, P. J. Yuan and D. X. Shen, Multivariate Statistical Analysis and Calculation Program. Wuhan: Huazhong Institute of Technology Press, 1987. R. A. Johnson and D. W. Wichern, Applied Multivariate Statistical Analysis. NJ: Prentice-Hall, Englewood Cliffs, 2007. D. Johnson, Applied Multivariate Methods for Data Analysts, CA: Duxbury Press, Pacific Grove, 1998. S. Misra, P. Venkata Krishna, V. Saritha, H. Agarwal and A. Ahuja, "Learning automata-based multi-constrained fault-tolerance approach for effective energy management in smart grid communication network," Journal of Network and Computer Applications, vol.44, pp.212-219, Sep. 2014. M. Yigit, V. Cagri Gungor, G. Tuna, M. Rangoussi and E. Fadel, "Power line communication technologies for smart grid applications: A review of advances and challenges," Computer Networks, vol.70, pp.366-383, Sep. 2014. R. Majumder, G. Bag, G. Velotto and A. Marinopoulos, "Closed loop simulation of communication and power network in a zone based system," Electric Power Systems Research, vol.95, pp.247-256, Feb. 2013. IEEE Std C37.118TM-2005, IEEE Standard for Synchrophasors for Power Systems. New York: IEEE, 2006. 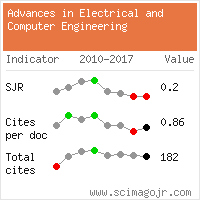 Citations for references updated on 2019-04-20 04:57 in 163 seconds. Website conception, design and maintenance by Eugen COCA. Content updated on 28 Feb 2019. Site engine updated on 28 Feb 2019. This page was generated on the server in 0.098 seconds and loaded in your browser in > seconds.